Artist's depiction of a basajaun and its female companion, a basandere. When one thinks of colonial Spanish missions, we often picture those famous churches and presidios of California, but truth is the Spanish had missions all over New Spain. Many of these were located in the vast expanse of present-day Texas, not the least of which is Misión San Antonio de Valero (aka The Alamo). If you're road-tripping through Texas this summer, you'll find a number of these extant missions to also be delightfully haunted. 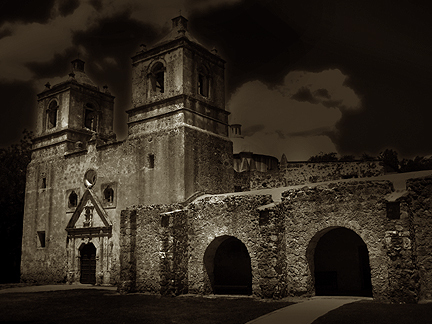 Trailing south of San Antonio are four 18th-century missions legend says are haunted. Mission San Jose has tales of an oft-headless priest, while a creature resembling a wolf and a disquiet native american man have been spotted at San Francisco de la Espada. Another native man has been seen at San Juan de Capistrano. 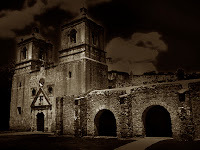 At Mission Nuestra Señora de la Purísima Concepción de Acuña, the least restored of the four, phantom soldiers have been spotted and heard from time to time. Presidio Nuestra Señora de Loreto de la Bahía, has seen six wars and countless battles. Spanish, Mexican and Texas soldiers are all claimed to still walk within the stone walls of this fortified mission at the heart of Goliad. Some were executed by Antonio Lopez de Santa Anna on Palm Sunday 1836. Other apparitions include a short priest who seems to shuffle listlessly about the churchyard. Others have reported spotting the ghost of a young woman praying in the chapel. These are just a sampling of the many missions established in Texas between 1689 and 1789. Many of these may be haunted, but finding their stories can be harder. If you visit any of these extant missions (or even the archaeological ruins of those long-gone), be sure to ask about the haunted history. I would love to hear what stories you might uncover. Florida may be the Sunshine State, but that just means it casts a lot of shadows. Visitors to Bradenton Beach report witnessing some of these shadows walking along the beach around sunset near the Curry House, which was built in 1901 and then torn down in 2004. The stretch of sand nearby, however, still seems permeated with disquiet souls like a woman who appears to have drowned as well as a young boy and his dog. That state's famous Key West purportedly gains its name from a misunderstanding. Originally, the Spanish called the isle Cayo Hueso (Bone Key) for the many bones they found there. It seems the pre-Columbian Calusa people used the isle as a graveyard. Upon this supernaturally saturated soil, centuries of violence and tragedy have accumulated like barnacles on the hull of a derelict ship. A ghostly figure stalks the building now housing Key West's Hard Rock Cafe; a mysterious, demon-possessed doll hangs about the East Martello museum; and the oldest bar in America, Captain Tony's, was the site of a mass hanging (75 people). Daytona Beach's Boot Hill Saloon is rumored to be haunted by the disquiet souls of the many bikers who called the bar home over the years. Objects move by themselves and an unplugged jukebox has played tunes. Now a realty office, the Longwood Village Inn first opened its doors in 1923. 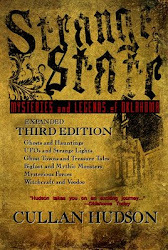 Many believe it to be haunted by the ghost of its original owner who died there. Cold spots let you know he is near. The spectral giggles of ghost children have been heard time and again as well. In Rockledge, a restaurant called Ashley's is rumored to be haunted by a woman named Ethel Allen who was murdered and dumped nearby on the shores of the Indian river in 1934. She is thought to have been an employee when the establishment was known as Jack's Tavern. Witnesses describe hearing a woman's soft, whispered voice when the restaurant is empty. Objects placed in one location upon closing will be found to have moved by the next morning. Tampa's Ybor City neighborhood is the location of the storied Cuban Club where elevators move of their own accord and a piano can be heard tinkling with no player seen. The nearby Tampa Theatre has been known to show movies when the building is closed. The former Ringling Estate in Sarasota, FL is haunted by an entire sideshow of spooks. Now a school for art and design, many students have spotted a flapper-era woman, dubbed Mary, glaring at them from a second storey window in what was once a famous hotel. The legend says Mary fell for a traveling salesman who wanted nothing to do with her. In her despair, she hanged herself from the stair rail on the second floor. St. Augustine's famously haunted lighthouse shouldn't be missed either. The ghosts include, its chief architect, one of its keepers, and the two young daughters of Hesekiah Pity, a keeper from the 1800s. Osceola Street), named for Jown W. Harden who was murdered in his backyard in 1975. The killer was never caught, and some say Harden has never left. Even his own wife claimed to have seen him roaming the house. Interstate 4, where it crosses Lake Monroe, is said to be cursed. Over 2,000 accidents have occurred here since 1963 and many blame it on a legend that several graves were paved over to make the road. Moreover, ghostly motorcyclists have been spotted as well. In Ocklawaha, you can find Ma Barker's house. The notorious outlaw and her equally villainous son were gunned down by the FBI in 1935. 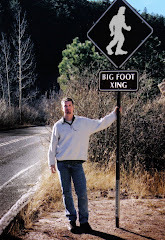 It's believed that she walks there still.